What makes the DTES the beating heart of social change action in Vancouver? Join us for a series of expertly guided walks to explore the sometimes hidden places and operations of social impact that make this place come alive. Get your tickets here! DTESimpactwalkingtours.eventbrite.ca Share and invite your friends on Facebook $25 per tour or pay what you can, if you can afford more, or less, of the standard cost. 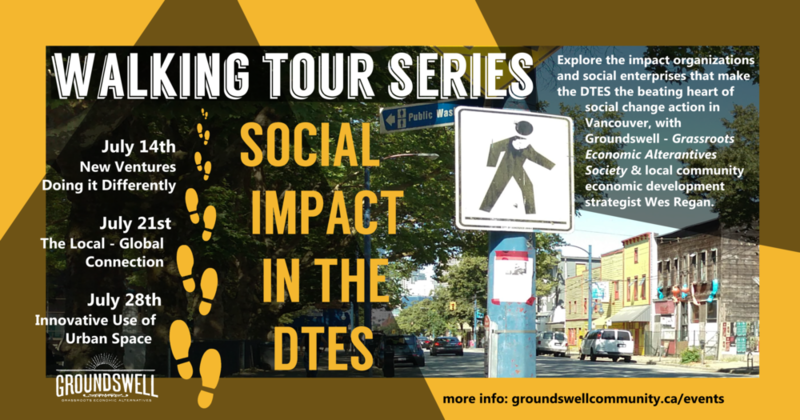 Your walking tour host, Groundswell, is part of a vital ecosystem of social enterprise in the DTES, where some of the oldest, newest, most diverse, and widest serving social enterprises - non-profits, social impact businesses, co-operatives, etc., - are found. 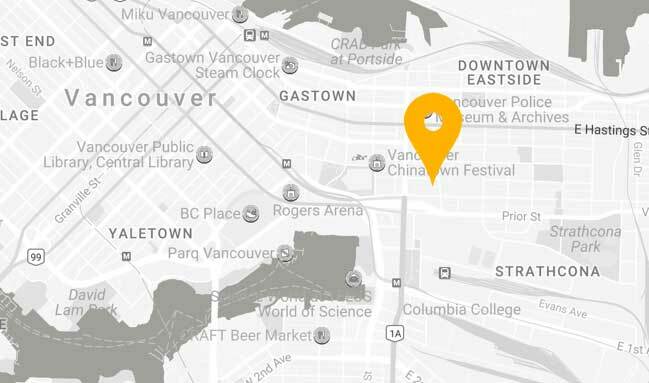 Being located in the DTES surrounds us with incredibly deep local and historical knowledge, lived experience and place-based expertise, creating an abundance of social and community capital. We are hosting a series of walking tours to explore this unique social and economic ecosystem and share what we’ve learned from our neighbours, partners, and alumni that make this neighbourhood a hub for innovative social action. Come and get to know the people and places that help make up the beating heart of Vancouver’s social economy. Learn about your tour quide, local community economic development strategist Wes Regan, below! Groundswell is cultivating entrepreneurial skills in people who care about people and the planet more than profit. What does this look like? Meet a few of the people and projects they have launched out of Groundswell’s community and landed in the local community, and see first hand the transformative impact they’ve had in their own lives and in the community around them. Meet at Another Space, 1523 E Pender Street - a brand new community art and wellness hub. Wood Shop Worker's Co-operative - where dismantling pallets means dismantling the economic system. Groundswell Grassroots Economic Alternatives and REV-Up - putting people's dreams and values to work for them. Snacks and beverages on us at Groundswell. Stick around for a Groundswell Info Session at 6 pm and stay late for a social night of live music and refreshments at the cafe! This cluster of social enterprises shows how an intense local impact can actually grow to be part of a broader ecosystem in other communities that want to see their economies guided by the same values. These projects have scaled to have a scope of influence with impact far beyond the DTES: sharing their knowledge, best practices, their own conscientious practices, and more, and gaining an international profile due to their success. July 28th, 4:00 pm start at Soul Food's original vacant lot farm at E. Hastings St. & Hawkes Ave. These are not your typical storefront enterprises: these highly visible but mysterious operations are employing innovative uses of space for unexpected social purpose, programming, impact, and placemaking that is much deeper than appears at a glance. Occupying a mix of private and public space, whether it’s local food serving local housing food programs, creating low barrier jobs, or providing a service to local businesses diverting waste from our regional landfills, the projects have deep, intensive uses, yet we often pass by without realizing the full scope of what is going on. Hosted by Groundswell Grassroots Economic Alternatives, a non-profit society building a community of people and projects that are part of a greater movement for positive social and economic change. Participants receive training and mentoring in Groundswell's DTES café and clubhouse location to create community based projects and ventures that put people and the planet before profit. Tour guide Wes Regan is a social venture start-up mentor at Groundswell and has worked in sustainable community economic development in Vancouver’s Eastside since 2009. He is the founding Executive Director of the Hastings Crossing Business Improvement Association (HxBIA) Canada’s first Social Innovation BIA, and co-founder of award winning greentech firm, Urban Stream. Wes’ career has spanned urban food system development, community engagement, economic planning and government advocacy and academia. Passionate about capacity building, education and engagement, Wes is also an instructor at Simon Fraser University’s Community Economic Development Program. He has spoken about community economic development, green businesses, new economy thinking and urban issues at conferences in the United States and Canada and his ideas and opinions have appeared in TechVibes, the Vancouver Observer, the Georgia Straight and other publications. He is also the Green Party of Canada’s Critic for Urban Affairs and Housing.